This Jute Erosion Control Cloth is a tough, natural, biodegradable geotextile used to stabilize slopes and control soil erosion. Otherwise known as JGT (Jute Geotextile), this product provides an economical and effective alternative to many other erosion control methods. Hopefully, to help hold mulch in place on a slope next to our house. Biodegradable and am using it to reinforce a refashoined sloped terrace. For earthen plaster wall application, as a support mesh. This material is the one to use to keep a sloped surface planted with ground cover and mulch from sliding away. Because I liked it, it's different and nobody around me has curtains made of this! This is great design texture for my gift shop displays! Best price that I found . Using this for Halloween decorations and props. I'm doing a renaissance faire and wanted to make my booth look period. The perfect solution to hide pond liner edges while plants grow in. Nothing else we have tryed has worked so we are trying this. Best price for erosion cloth I could find. To prevent erosion and soil sliding for planting on hillsides. Love the open weave. We will use it, in addition to some purple cloth, to drape over a cross during Lent in our Church. This is such a unique piece of fabric. I like different. This will become a dust ruffle in my farm house. Running an event that is Pirate themed and fabrics will be used for props, etc. I plan on using this fabric on a life size stable as part of the ceiling and in the manger and around the base of the Christmas trees. I am using this on stage as part of an exterior setting. We will glue Rubber mulch to the cloth and then drape and shape to create a "mound of earth"
Watched product video and it looked like exactly what I was looking for to use with my newborn photography as an underlay. Hope it is nice and chunky as seen in the video! I use this jute in my Halloween display. To use on my mantle, farmhouse look. Our neighbor made outdoor curtains out of this and it looks awesome. How many months does it take to biodegrade? BEST ANSWER: After almost 2 years (2 summers growing season) mine has lost strength and is falling into bits of twine. The mesh in the dryer areas of the yard is still quite strong, the mesh where the grass was thickest has almost completely vanished. So the answer would be "it depends" on how wet you keep it. In a wetter climate it would have been cone by now. Thank you for your question! Jute erosion cloth, along with other natural erosion cloths, are fully biodegradable in 2 to 3 years depending on soil and weather conditions. Essentially, the wetter the conditions, the faster it will deteriorate. Mine has been down since February 2017 and is still there, sort of. It is not as strong as it was - I can easily break the threads, and it rips if I snag it with a rake. So it's clearly degrading. We put ours down over a year ago and it is still there. It stopped the erosion and vegetation is now growing over it. I don't think it has degraded at all. how long does it take for this product to biodegrade in soil? BEST ANSWER: Thank you for your question! Jute erosion cloth, along with other natural erosion cloths, are fully biodegradable in 2 to 3 years depending on soil and weather conditions. Essentially, the wetter the conditions, the faster it will deteriorate. Will it hold mulch in place if I spread the mulch on top of the cloth? BEST ANSWER: I doubt that the mulch will stay in place if put on top of the cloth if the location is on a slope. I used the cloth, held in place with bio-degradable stakes, to hold straw and grass seed in place on slope. It should, but it can depend on the conditions, like if there's a slope. I have 2 to 1 slopes of bare dirt leading down to and away from a new intended garage. Should I seed, mulch then overlay with the fiber? BEST ANSWER: We recommend consulting a landscaper. Is this product treated with diesel fuel or other toxic product? I'm using it for a Halloween party. BEST ANSWER: When Erosion Cloth is manufactured, a small amount of petroleum based oil is used to soften the jute fibers before spinning. Erosion cloth is primarily used to cover dirt hills and grades to prevent erosion. It is also often used in theatrical applications but is usually custom finished to be fire retardant in these cases. Will This help in new lawns from seed to keep birds out ? BEST ANSWER: Yes, a bit. It makes it harder for the birds to see the seeds. NO. It is mainly for erosion control on hill sides. Does the cloth require any type of pegs at the top to keep it from sliding down a steep hill? If so, what is used and do you provide those? BEST ANSWER: You could use stakes, or rocks. Something weighted would work fine. Does the odor eventually dissipate? If so, how long does it take? This would be outside about 4 feet from the kitchen. BEST ANSWER: We didn't notice much of an odor, but we were using it 12' away from the house. overall, we were very happy with it. Honistly I don’t remember it having an odor! Would this stop my dog from digging? He digs huge holes, and if I fill them up, he digs them out again. I need help. BEST ANSWER: It probably won't prevent him from digging, this product is used for controlling erosion, not digging animals. how many yards are on a roll of jute? BEST ANSWER: We cut this material from extremely large rolls. Will this catch on fire if the area is too dry? BEST ANSWER: Yes! This is NOT treated with any fire retardant and it will burn if sparks or flame reaches it. I set mine on fire with the flame-weeder and had to stomp out the flames. DO NOT USE FOR DECOR! It is not flame retardant. Can I shoot Hydroseed over it ? BEST ANSWER: I do not know the answer to your question. I suggest you call a couple hydoseeding companies and ask them. I used the cloth on the ground to cover a newly seeded area and then pulled it up by hand. 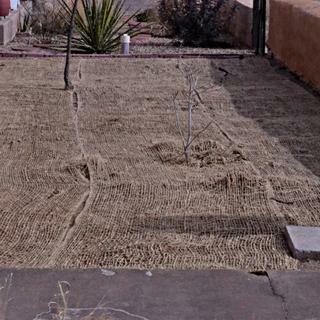 The highway departments of New Mexico and Arizona hydroseed over jute, and sometimes they hydroseed and then cover it with jute. I don't know why they do it both ways. BEST ANSWER: We wouldn't recommend it for indoor decorative use because it has a strong odor and sheds fibers easily. Yes, I use it for decoration. How long will cloth last? BEST ANSWER: There are varying factors like temperature, moisture, and humidity that the rate of decomposition depends on but this cloth will generally last about 3 to 6 months in the ground before bio-degradation. Is the price a running yard? BEST ANSWER: Yes, the price is for a linear yard, not a square yard. BEST ANSWER: Depending on soil moisture conditions and weather, it's durability is rated at 1-2 years. How wide is burlap netting? BEST ANSWER: This fabric is 48 inches wide. if i use for drapes, will the smell go away? BEST ANSWER: Probably not. We don't recommend using this for drapes. BEST ANSWER: You technically could. Can you use it on a wall and paint over it? Can I use this to line a drainage ditch? BEST ANSWER: Excessive water may affect the biodegradability of this product, but we don't see why not. how loose is this weave? For example, how far apart are the strands or how big are the holes? BEST ANSWER: Approximately 0.5" x 1". Can I wrap around tomato cage to protect garden plants from small animals? BEST ANSWER: The openings may be too big for animals like mice, plus a determined animal could probably chew through it. About how lg are the openings in the 48/10 burlap? BEST ANSWER: Approximately 0.5" x 1"
Can you use it in ravines next to gravel roads to prevent any further erosion ? BEST ANSWER: This erosion cloth is made to use with soil, we can't say for sure how it will perform with gravel. How will jute matting hold up with deer walking on it? BEST ANSWER: We haven't had anyone ask about that application, but it should be OK. Please keep in mind that this material is biodegradable so it will degrade over time. Will it keep volcanic rock from sliding down? BEST ANSWER: We wouldn't recommend this product for that use because it's biodegradable and would disintegrate over time. We have snakes and small wildlife getting caught in plastic netting in erosion control blankets. Will this allow trapped wildlife to squeeze through if they are caught in it? BEST ANSWER: It really depends on the size of the critters. The spaces in between the weave are about 0.5" x 1", but this jute erosion cloth has some 'give' to it so the holes can be stretched apart slightly. How many yards will i need fir a 10x22 slope? BEST ANSWER: You'd need about 19 yards. You would need to attach a few widths together to get 10' across. would this work as a garden trellis? BEST ANSWER: It probably wouldn't. Easy to install and so far is doing a great job keeping the soil from sliding down the hill. Easy install. The soil, so far, has not moved and is no longer sliding down the hill onto the sidewalk. Just as pictured for a great price. Did have a strong chemical smell to it however. I am very happy with both the jute cloth quality and the delivery time. I used this product to hold bark on a steep slope. It was easy to unroll and cut to the size I needed. I used it to protect wildflower and grass seeds from wind erosion. It's working as I hoped it would. This fabric worked perfectly for the type of bed skirt I wanted. I got the end of the roll and had to work a little harder to make it work on the entire bed. But it turned out beautifull. Holds my mulch in place nicely! 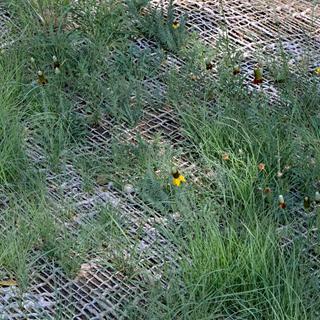 Easy to use fabric to minimize and/ or prevent soil erosion. soil erosion on hillside. This is great. worked really well for our haunted attraction.